This holiday Gospel celebration has captured the hearts of our audience that it returns for its 15th Anniversary as part of our season. 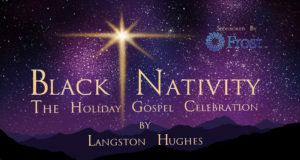 Spoken word, song, music, dance, and theatre combine to create this one-of-a-kind Christmas pageant that has become one of the holiday traditions our community revels in. Hughes’ retelling of the Nativity Story encourages audiences to find joy and asks us all to look inward and find the wonder in life itself.